Back in the day where all the major companies had their own operating systems ,when it came to mobile business ,Android was blooming up and soon was adopted mostly as the primary operating system by all major companies may that be Samsung ,Sony ,Htc & so on. For the first time ,Samsung looks like to bolster its own operating system again instead of sticking with its conventional Touchwiz UI build on top of android! 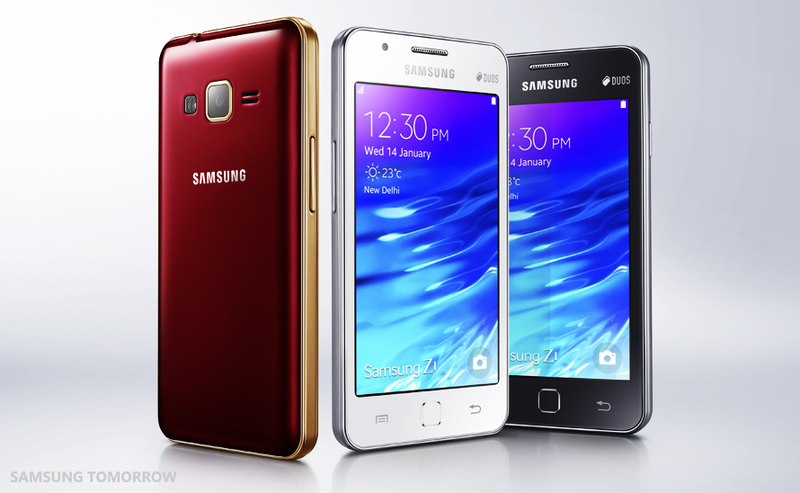 This year at CES 2015 major devices launched by Samsung were having Tizen OS on board ,leaving android ! Looks like Samsung plans to go in a different direction of its own. Last year at Tizen developer conference 2014 ,Samsung showed up a demo of Tizen OS running on their First Tizen Smartphone : Samsung Z ,which had specs same as that of Samsung galaxy S5 including all of its fingerprint sensor,heart rate monitor and the basically the whole deal ,Only Running Tizen ,tough it never made its way to retail stores. But since then there wasn't any buzz ,but only speculations being made about any new ,more improved device might be launched with more polished UI ,since Tizen been shown at developer conference was just the start or shall i say ,Tizen OS was in its baby steps ,Since that ,Today Samsung Launched its Latest low end device : Samsung Z1. Its always good to see new start up projects ,instead of the old major systems already settled up in the ever growing market for others to come. Google brought in their Android One program and basically cranked up the sales of many ! Maybe Samsung thinks this might be the way getting in the low-end market well owned by companies like Xiaomi ,Google (Android One) ,Motorola. 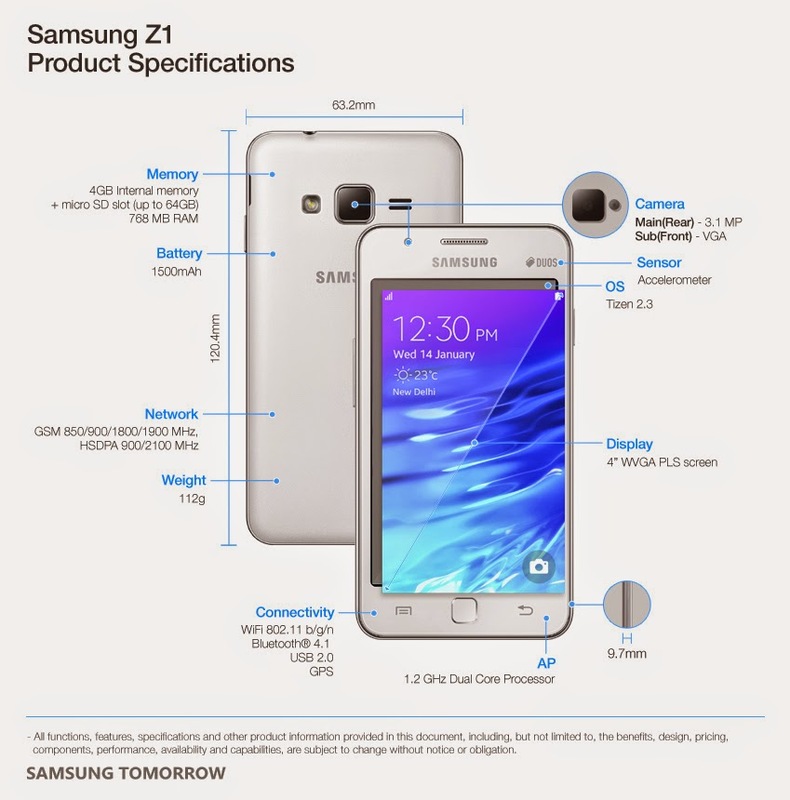 Samsung Z1 pretty much being a low-end packs up a 1.2Ghz Spreadtrum SC7727S dual core processor CPU having a Mali 400 GPU coupled with 768MB of RAM ,touting an 4 Inch PLS (480x800) WVGA display screen with 233ppi density , 1500 mAh Li-on battery ,a 3.1 MP Primary camera with LED flash & a secondary VGA camera , Bluetooth v4.1 ,802.11 b,g,n Wifi with 4GB internal memory having expansion upto 64 GB and the new big thing running on it : Tizen OS version 2.3 . As Samsung Touchwiz UI is being known widely for being heavy on the software side ,henceforth Z1 being a low-end device Samsung confidently says about how its new UI is light weight in its launch event delivering faster boot up speeds ,Same ultra power saving mode and enhanced web performance. They are also planning to give up free data same as that been done with Android one devices teaming up with Local Network Operators in India ,In addition, Samsung will offer consumers those with Z1 to have free access to premium content available on Club Samsung. Users can stream and download from over 270,000 songs, and watch over 80 live TV channels.It also comes with bevy of features like Sos alert where with just a press of the power button four times, the Samsung Z1 will send out ‘Help’ message to the user’s primary contacts and track the user’s location to provide necessary assistance which is best thing when it comes to personal security ,The built-in AntiVirus protection on Samsung Z1 automatically checks for any viruses when users install an app since this being a new operating system coming in town ! Consumers can also utilize Samsung Z1’s private mode to create their own private space where pictures and files can be saved. Best thing so far is that the Samsung Z1 is priced at INR 5,700/- and will be available in India from today ie.January 14th in White, Black and Wine Red in short today marks the day of the emerging era of Tizen OS competing Android one and Xiaomi.